“The Plain and Simple Truth for a Dazed and Confused World” from Christian Faith Publishing author Ronnie Copling defies the politically correct conventions of a culture too afraid to offend. Like Joshua, author Ronnie Copling confronts readers with the choice to worship the true God or one of today’s false idols. “The Plain and Simple Truth for a Dazed and Confused World”: truth for a politically correct world that must choose a God to worship. “The Plain and Simple Truth for a Dazed and Confused World” is the creation of published author, Ronnie Copling, who is an United States Army veteran, who has had tried his hand a couple of different jobs before falling in love with truck driving. Ronnie has visited each state several times, and has driven over 4 million miles. It was during all of those miles that the Lord’s message began to grow on Ronnie, and his relationship started to blossom. Published by Christian Faith Publishing, Ronnie Copling’s new book offers truth. In the Book of Joshua, Joshua gathers all the tribes of Israel and reminds them that their forefathers had served other gods. They needed to decide which gods they would serve. Joshua 24:15 states, “If it seems evil to you to serve the Lord, choose for yourselves this day whom you will serve.” Joshua loved his Jewish brothers and sisters, so he wanted them to realize they had been given a choice: worship the true living God or worship one of the many false gods of their day. View a synopsis of “The Plain and Simple Truth for a Dazed and Confused World” on YouTube. Consumers can purchase “The Plain and Simple Truth for a Dazed and Confused World” at traditional brick & mortar bookstores, or online at Amazon.com, Apple iTunes store, Kobo or Barnes and Noble. 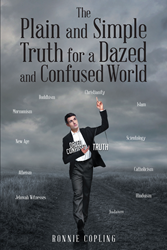 For additional information or inquiries about “The Plain and Simple Truth for a Dazed and Confused World”, contact the Christian Faith Publishing media department at 866-554-0919.